rec. 12-15 October 2004, Kunsthistorisches Museum, Wien. This CD is a co-production from Paladino Music together with the Kunsthistorisches Museum Wien, which has a substantial collection of playable historical instruments. 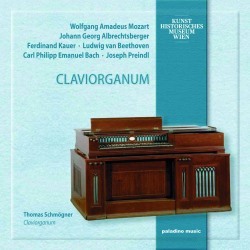 The claviorganum is, as its name suggests, a combination instrument amounting to a square piano sitting on top of a chamber organ. This particular example was made in about 1785 by organ maker Franz Xaver Christoph (ca. 1728-1793), but there are examples of this kind of instrument dating back to the mid-16th century, and the tradition of combination keyboards survived until the late 19th century. These were however never a popular or mainstream option, as they would have been highly expensive and more often than not built to commission from affluent nobility. The description in the booklet reveals the remarkable sophistication of this instrument, its only real disadvantage being the lack of a conventional sustaining pedal/damper, which means certain passages will inevitably sound over-pedalled, though this somehow fits in with the mechanical magic of the whole thing. The combination can for instance be heard to great effect in Kauer’s Sonata militare, which is full of programmatic colour and interest, from its tender opening to the sometimes melodramatic dramas which unfold later on, this is the perfect kind of piece for this instrument. There is novelty value in performances of better known pieces on this kind of instrument, but familiarity also orientates the ear towards its characteristics, and Mozart’s Fantasie KV 397 is in that regard the ideal opener. The piano sometimes seems to have much the greater volume over the organ, but this is the nature of the instrument and of register selection rather than the recording – the organ on occasion acting as a kind of sonic ‘filler’ or continuo. Indeed, there are some pieces played on organ alone, and the richness of sound in the pipes of this compact instrument can be explored in the Praeludien by Albrechtsberger and elsewhere. Sweet dissonances make Beethoven’s Op. 39/1 something of a highlight, stretching the mean-tempered tuning to the limits of credibility. The square piano without pedal can have the feeling of a hammered dulcimer, and the opening of C.P.E. Bach’s Fantasie has a refreshingly Balkan feel as a result, Thomas Schmögner taking the dynamics down to almost zero db at more than one point, and you can imagine the 18th century audience on the edge of their seats or reaching for their ear-trumpets. Mozart’s Adagio in C for Glass Harmonica will be familiar to those who have a taste for unusual instruments, and the glorious mixture of sustained organ notes and chiming piano strings in the same register creates a strikingly believable imitation of the original. The grand finale comes in the form of an extended Fantasie by Josef Preindl, which presents a series of variations on themes from Haydn’s oratorio De Jahreszeiten. This piece is another great showpiece for the various sounds of the claviorganum and the virtuoso capabilities of its performer. With a fine recording, excellent performances and good documentation this CD comes highly recommended. The entertaining nature of the programme is more than just a bonus, and while this kind of release will always have novelty status it in fact deserves to be right up there on your list of authentic early music desirables. Despite some restoration this claviorganum, the only working example surviving, represents the sounds of a long-lost past. As a design it might not have taken off, but it would have been the advanced Digital Sound-Sampling keyboard of its day, and I for one am delighted to give its charming sonorities a place in my home.